If you’re looking to save on costs with a used South Jersey office furniture dealer, try contacting the team at Bellia Work + Space Professionals. We can furnish your office with quality used, reconditioned and off lease furniture from current clients. 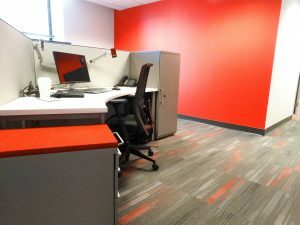 Whether your office is for corporate, healthcare or educational purposes, we can create a fresh, ergonomic environment for your employees and customers, all while saving your business on equipment costs. Office Design. We employ our own Real Time Design ™ technology that allows changes at any stage of the planning, reducing confusion and saving money and stress of redesign. You’ll be able to call the shots during the process, and furnish your office with well maintained, excellent condition furniture. Office Relocation. If you’d like to save on relocation costs with our refurbished desks and chairs, call on us to handle the tasks of moving your offices. We look after everything from transportation logistics to furniture moving and installation, while disrupting your business as little as possible. Inventory Management. Bellia offers web-based, efficient inventory solutions, enabling you to keep your office products in use and out of storage. We’ll help you establish an inventory plan that keeps products in our regional warehouses and available as needed. Furniture Installation. Should you call on us for your used South Jersey office furniture, our team of Certified Installers will deliver your furniture safely as per our strict guidelines. We can account for union and non-union contracts as needed. At Bellia, we work to create a better office environment for your team…one that adds productivity and increases your bottom line. If you’re looking to save with our used and reconditioned furniture, contact us today for a free workspace evaluation. Let Bellia help you love the space you’re in!